Your air filter installation is only as good as the panel holding frame. Proper installation of air filter panels is extremely important. Air leakage around and past the filter will reduce the efficiency of your entire unit. The key to sealing any installation is the panel holding frame. If it is not leak proof, dirty air will bypass and defeat the purpose of your filter installation. 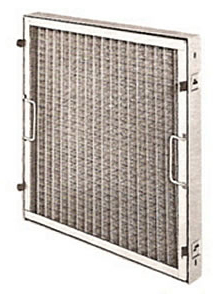 Dependable Falls Filtration holding frames are manufactured with the same skill and precision as our filters are produced. They will provide maximum insurance against air leakage. Falls Filtration holding frames are made of 16 gage hot dipped galvanized steel. A polyester urethane gasket is bonded to the ¾” retaining flange. Positive sealing pressure around the perimeter of the panel is applied against the gasket flange by spring clips, spacer buttons are stamped into frame to assure proper centering of panel during installation. Spring clips retain panel tightly in place in the holding frame shown above. Clips are standard on 2" frames, unless otherwise specified, and are shipped separately for installation on the job site. Installation instructions are furnished with the frame shipment. Falls Filtration holding frames are supplied with bolt holes assembly into staggered, flat or “V” shaped panel banks. When ordering frames for panel banks it is advisable to submit a sketch indicating the space available, required air volume, direction of airflow and side of bank from which the panels will be serviced. This will help us supply the proper materials for your successful painless installation. A drain hole should be installed to facilitate the collection of any adhesive that may run off during service and installation. All joints should be caulked to prevent leakage.